Reporting to the Vice President of Consumer Sales, you will be responsible for the day to day sales within the Paradise – Corporate Call Center as well as the growth of past client’s sales, by engaging with our Navigators Approach sales system, to build more repeat and referral business to develop our “Customers For Life”. Answering inbound sales calls from our normal ECSC websites & promotion, as well as Contracted program such as TD Visa and RBC programs: Hours of Operation, Customer Service Levels, Center and Staff Appearance, and in alignment with the company’s values. Communicate with the Cruise & Land suppliers, online and by phone, as needed to ensure maximum sales opportunities & high customer service. Maintain knowledge levels of all suppliers, including Cruise & Cruise tours, Land & Hotel, Insurance and Shore excursion suppliers, in order to present them confidently to all clients. Ensuring maximum participation for all ”in-center” training as well the learning opportunities available to all CCC & ICs, as the Weekly & Product Webinars, and the Monthly Team Meeting. Local execution of staying in touch with our past clients, and marketing initiatives such as Cruise Nights as well as our company’s core promotions – One Day Sale, World Explorer Event etc. If the above description sounds like you, and you share our values of Teamwork, Integrity, Respect, Dedication, and Fun, then we want you on our team! We are Transparent. We communicate openly and honestly, at all levels, upwards, sideways and downwards. We surface difficult issues quickly, we act, we learn. 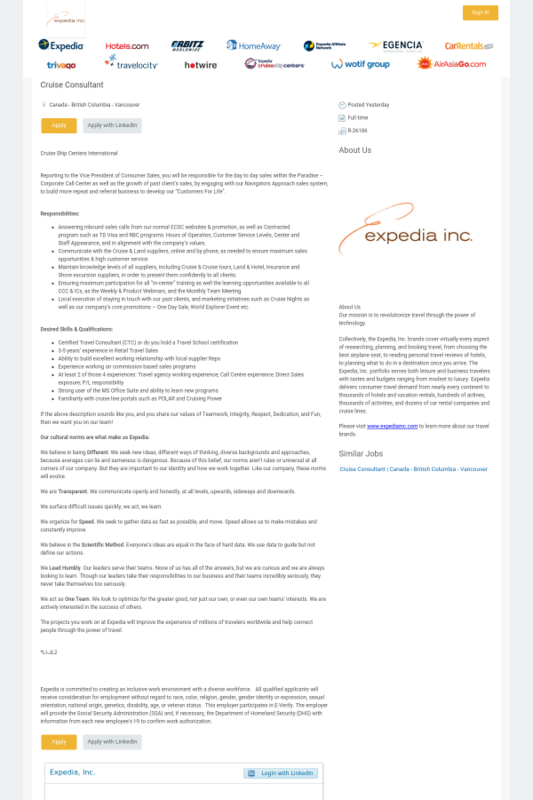 The projects you work on at Expedia will improve the experience of millions of travelers worldwide and help connect people through the power of travel.